Abbott's Caramels are so much more than candy! | Winners Drink Milk! Abbott’s Caramels are so much more than candy! It is always amazing to you may meet in the early hours before the Dairy Bar opens. This year I had the pleasure to meet Jay Abbott- yes the Abbotts candy guy! Yearly we received these great boxes of Abbott’s caramels wrapped in white and yellow paper and they hardly get to the table before they are gobbled up! Meeting Jay this one morning was such an incredible meeting I just had to share his business and how they use dairy daily! 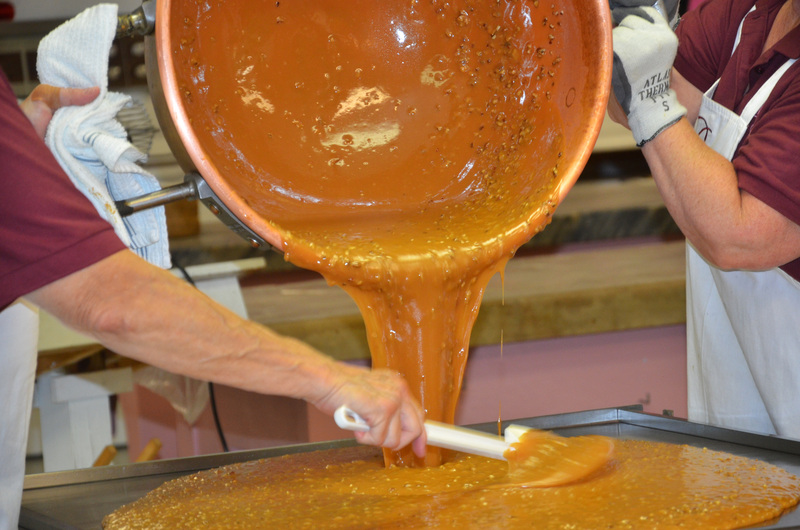 Can a recipe from the 1890’s blending milk, butter and sugar over high heat in a copper pot still make delicious gooey caramels? It sure can, as seen daily at Abbott’s Candies in Hagerstown Indiana. In addition to these handmade caramel delights, Abbott’s also hand crafts almost 49 flavors of cream and nut chocolates along with several novelty confections. Abbott’s Candies was started by William C. Abbott as a sideline to his restaurant business in the late 1890’s. With such great success he decided to concentrate on the candy making along with his son, Bruce, who carried on the business after W.C.’s death. After Bruce’s unexpected death in 1949, his widow Rhea Abbott and her mother-in-law Florence Abbott took over the business with no candy-making experience. With the help of several loyal employees, they were able to keep the business operating. 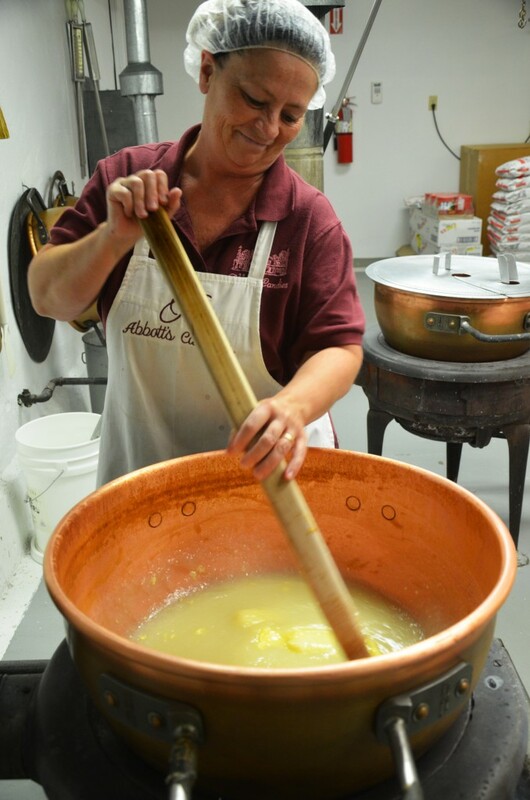 Rhea carried on as the candy maker along with the help of her children. Rhea and her daughter Suanna continued to make Abbott’s Candy well known in the candy industry. In 2012, the candy factory & store were turned over to the Noel family. Jay & Lynn Noel who owned Abbott’s Also candy stores in Indianapolis, which carried all the Abbott’s candies for over 20 years had a lot of experience with the Abbott’s traditions. Their two sons, Jason and Ryan, are now also involved with the family business. Most recently, Jay along with the Abbott’s staff were named one of the 2015 Indiana Artisans. Jay enjoys talking to store visitors reminiscing old memories about when they received a box of caramels or chocolates or a hand-made cream filled Easter egg from Abbott’s as a child. They might have forgotten the name but as soon as they see the box or the candy they remember with fond memories. 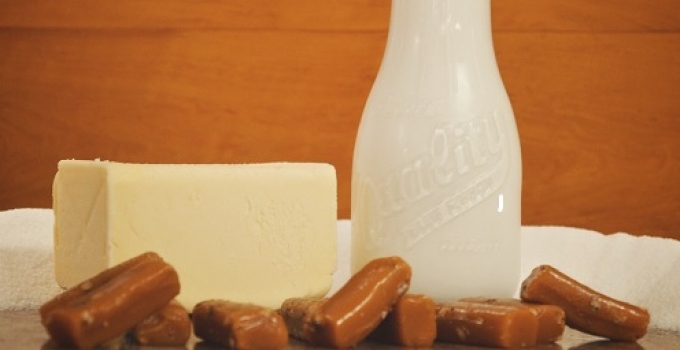 It is important to the Noels that the candy is made with the same recipes and methods as used by W.C. over 100 years ago. This is one of the key reasons customers return to Abbott’s or send gifts of Abbott’s candies all over the world. Abbott’s Candies is located in what was originally a Presbyterian Church built in the 1850’s in Hagerstown Indiana. Stop by to see this old but sweet story in the making. Tours, Fundraising and Wholesaling are also available. Abbott’s Also Candy Store carries all of the Abbott’s candies and is located off E. 82nd Street in Indianapolis.